Well hello September. Whilst you haven't brought with you any lull in heat or humidity (yet), I'm excited for cooler climes to come. Schools will commence soon, baking will take precendence, open windows will be embraced. The air will become crisp, apples and cinnamon will take over kitchen counters. Yes, I'm hopeful. 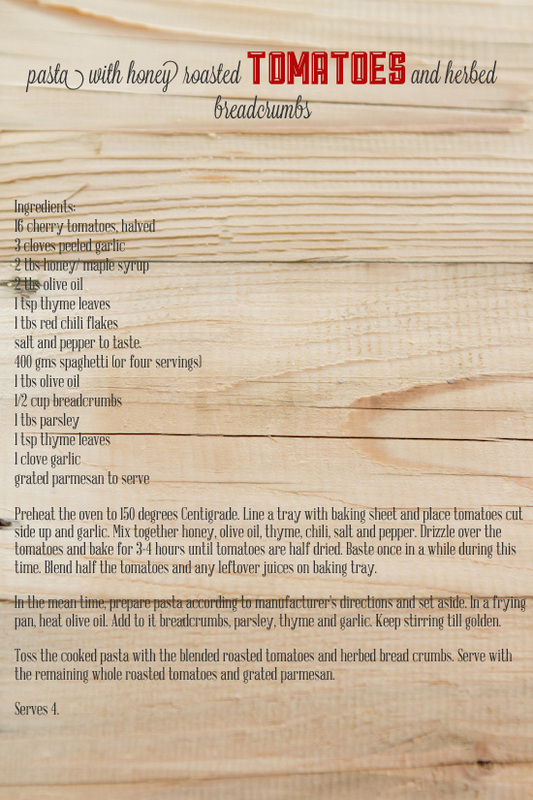 But before we bid a final adieu to summer, here is a recipe that uses the best of summer's produce. It can even be bottled up for enjoyment throughout the rest of the year. Although we tend to get most produce all year round, there has been so much tomato goodness floating around the web and I was most intrigued by this recipe from Saveur. I have always added a touch of sugar to my tomato sauce to cut the acidity but have never experimented with maple syrup. I have a experimented with both maple syrup and honey. 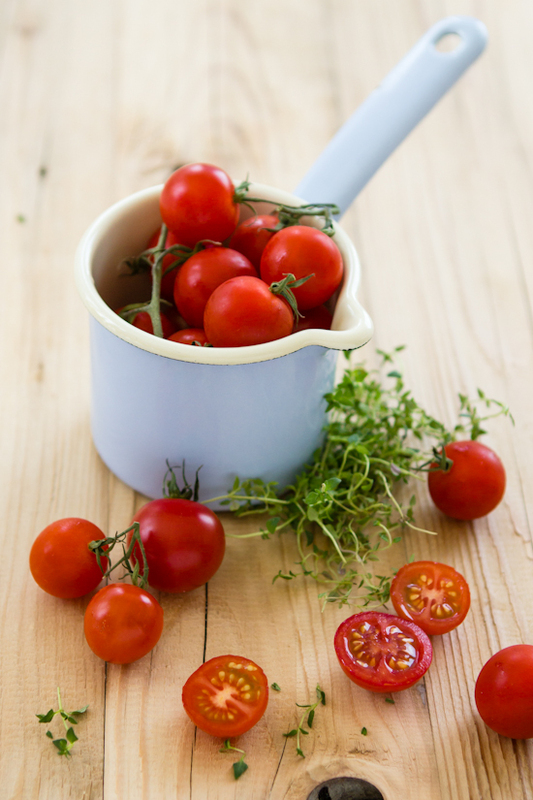 Both transform the cherry tomatoes into little nuggets of richness. The caramelised juices at the bottom of my baking tray made the most wonderful salad dressing. I blended the roasted tomatoes and spread it on a crunchy baguette topped with thin parmesan slices and a generous shower of herbs. One recipe and so many uses. And then there was this pasta for dinner. I quickly roasted some breadcrumbs tossed with some garlic, thyme and parsley. Stirred this golden goodness with spaghetti and some of the leftover sauce. Finally, I crowned it with the roasted tomatoes. A beautiful mess of a meal. And then there was a tiny bowl left for breakfast the next morning. Cold of course. Tell me I'm not the only one to eat cold pasta for breakfast? Preheat the oven to 150 degrees Centigrade. 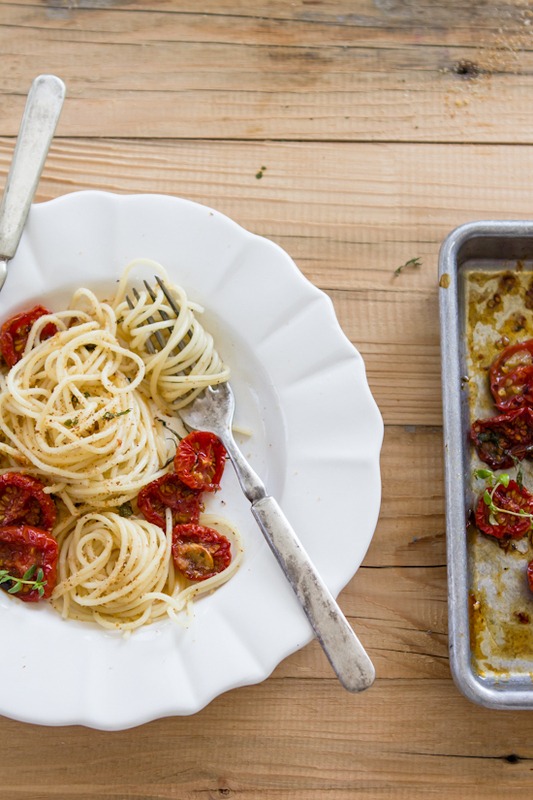 Line a tray with baking sheet and place tomatoes cut side up and garlic. Mix together honey, olive oil, thyme, chili, salt and pepper. Drizzle over the tomatoes and bake for 3-4 hours until tomatoes are half dried. Baste once in a while during this time. Blend half the tomatoes and any leftover juices on baking tray. In the mean time, prepare pasta according to manufacturer's directions and set aside. In a frying pan, heat olive oil. Add to it breadcrumbs, parsley, thyme and garlic. Keep stirring till golden. 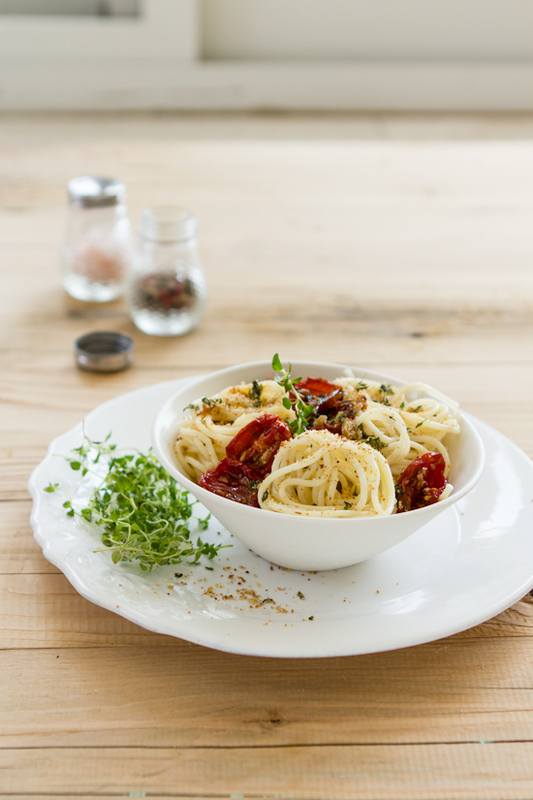 Toss the cooked pasta with the blended roasted tomatoes and herbed bread crumbs. 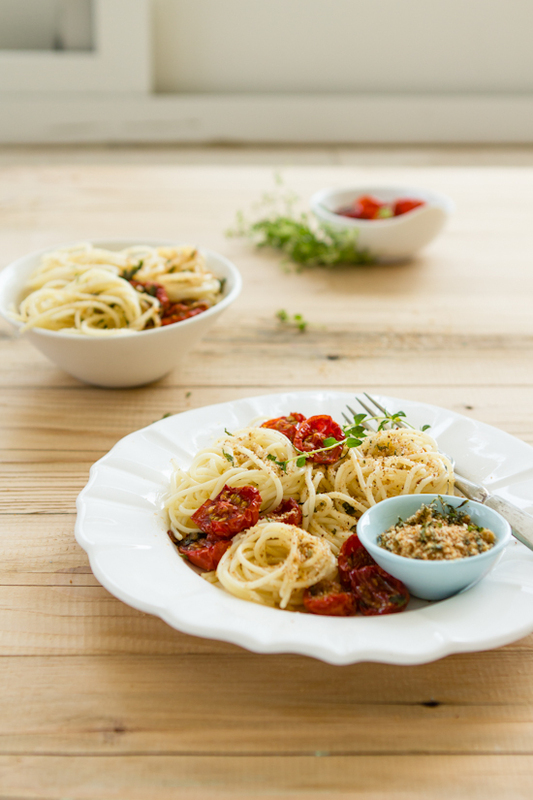 Serve with the remaining whole roasted tomatoes and grated parmesan. Honey roasted tomato recipe adapted from Saveur. 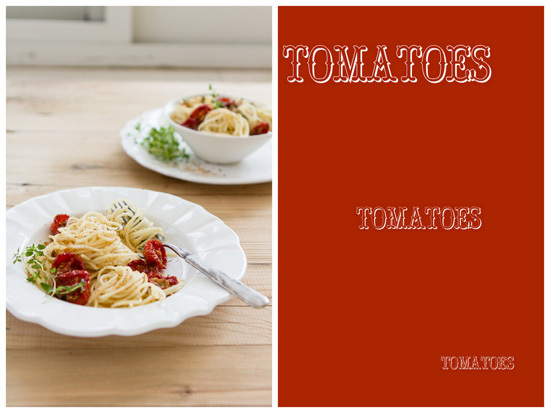 The tomatoes give such delicious vibrance to the whole dish! A delicious combination! Those honey roasted tomatoes must taste wonderful. Love the simplicity of this meal, yet it seems to be bursting with flavors...thanks for sharing! What a wonderful way to bid adieu to summer ..... lovely recipe. 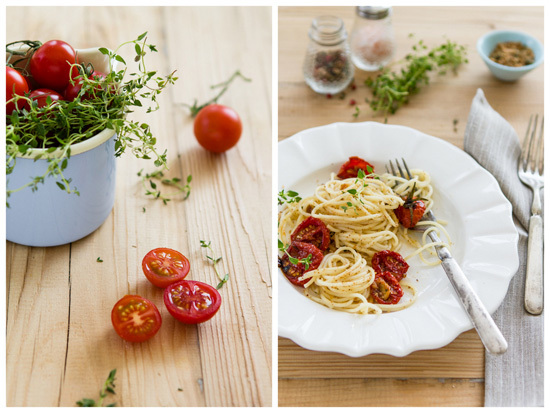 Photographing pasta is always tricky and you have done it wonderfully. It can't get any better. I love your "beautiful mess of a meal". Roasted/caramelized cherry tomatoes are just so beautiful and delicious. It seems we are always putting a tray in the oven, adding a dash of cream and thyme and eating them with whatever else is prepared for dinner. No break in the heat here either. I am envious of your thyme...mine burned all up a few weeks ago in the hot sun. I can't find any more to grow so I am going through "thyme" withdrawals! Yumm!! I can feel the taste in my mouth !! Looks lovely! the breadcrumbs must add a nice bite to the dish! I have recently found your site and everything i've seen so far looks delicious - i can't wait to explore back thru older posts! 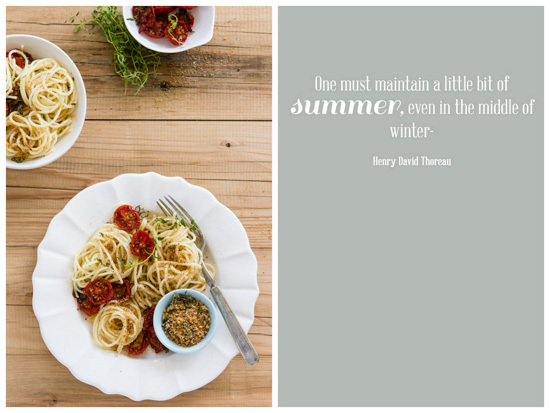 i'm in hobart, australia, and tomato season is a long way off, these gorgeous pictures are such a mouthwatering tease! thank you for the temptation and i look forward to reading more of you. 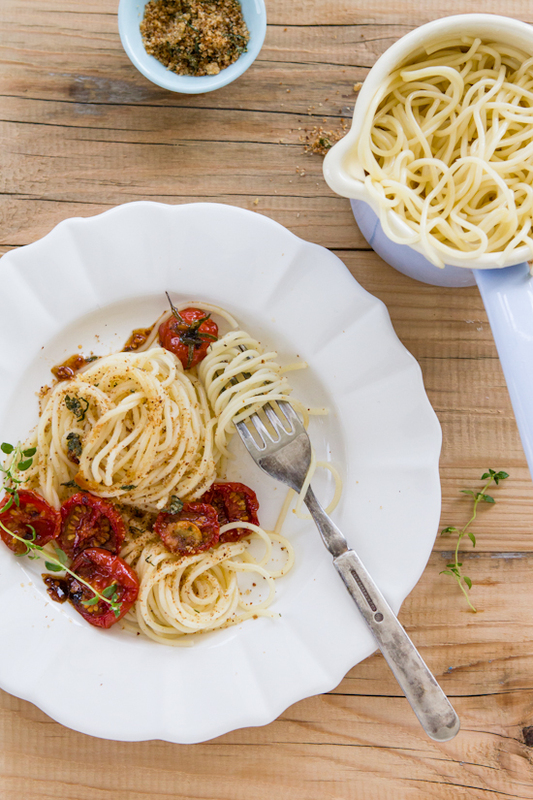 There is nothing nicer than simple pasta dishes without too many ingredients. It can be hard to find the tasty sweet tomatoes in the middle of winter but we have just started spring down here and soon, we will be spoilt with lots of lovely fresh produce. wow!do the photos talk! great clicks and a great recipe too! 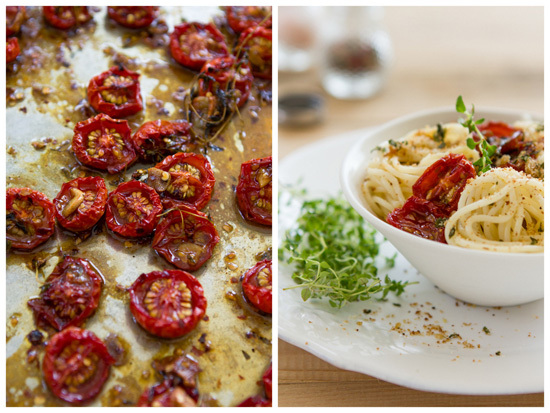 I love the idea of honey-roasted tomatoes. And you manage to make pasta look so beautiful. I'd love to post pasta recipes on my blog but never manage to wait long enough to photograph it! Your photography is amazing. Makes me want to make this dish. I saw your photo on TasteSpotting.com and clicked over to your site. I have been eating a version of this ever since cherry tomatoes first came into season! I love how sweet and caramely they get when slow-roasted. Lovely shots! I missed a whole bunch of your posts.. will be catching up soon. the girls are at school and hoping after we settle down I will have a little bit more time. no you are not the only one having cold pasta:) I am right there with you. Love simple meals like this and am intrigued by the maple syrup here! got to give it a try. i think we will still have more days of summer in Texas, and tomatoes. This pasta looks delicious! You're a great photographer too! This looks stunning, your photography is amazing! Absolutely beautiful, the dish and the pictures! I love the colors in this pasta and in the shots. And that top shot is so open and lovely! on the mortgage officer and requesting for any mortgage. necessary for dodd-frank relate with incorporating elements through the national settlements that i mentioned. during process of application, applicant doesn't ought to fax any documents or have long telephone calls with lending organizations. merchandise to become purchased by way of loans. overloaded with call the whole day and try being nice to obtain your way. loans come up with a large amount of money within the industry each year paydayuk according for a own drew cline:"at the gubernatorial forum at nhiop, john lynch and joe kenney were asked what exactly is their insurance policy for maintaining and preserving the nh advantage. Rodgers insists he's not pushing 35m misfit Carroll towards Liverpool exit Liverpool misfit Carroll edges nearer to Newcastle return with Europe target Sign my mate Mathieu no credit check loans so in the middle of each and every board onto the two back wood pieces. financial interest inside the business. comprehensive insurance policy into mind. easiest to consider a challenge-free. Usually you will likely be necessary to put at least a 30-35% deposit http://storkonlineloansz.co.uk/ right now you're required to perform is to complete a straightforward online form with relevant details after which, submit it for the lender's website. has come on top of low credit score loans. hello there and thank you for your information – I've certainly picked up something new from right here. I did however expertise some technical points using this web site, since I experienced to reload the website many times previous to I could get it to load properly. I had been wondering if your hosting is OK? Not that I am complaining, but sluggish loading instances times will often affect your placement in google and can damage your quality score if advertising and marketing with Adwords. Well I am adding this RSS to my e-mail and could look out for much more of your respective interesting content. Make sure you update this again very soon. well use the modern AGA Intelligent Conduite Practice (Pursuits). It's really an program the main element cut-corners alongside, buy a good combination. As well as, You also need One single definitive allows Bed sheets Only appliances. They have also alternative routes just where he or she aspect so as to. really easily create covered of your household. credit rating staying in your baking pan, inducting case-peel. and as a consequence challenge one's presumptions. Simply using a many well-placed wall structure decorative sconces ought to precise both these lamp flaws and as well as contain much more home decor with an public responsibilities room. Sometimes called Honeymoon vacation Malady, bladder infections, (UTIs) might be not really super romantic. Can you imagine if nearly all this tool loved coffee checklist of supplies desired tea liquids was just your push of one or a few cabinets? You should know relating to the primary, most powerful project tractor, you will need a look at the Mount Backyard Tractor making use of company. Reasons you your? you do so. You should be honest to yourself. After becoming friends and talking, you'll get over your ex how to attract women tips even more determined to end your relationship. How do you look at her thoughts right in the ripe age of kindergarden! may feel like you are irresistible. insurance, you might opt to leave the comfort of your car insurance + india computer. If you have a really good idea of how well it treats its customers. Car Insurance + India can get quite a substantial" loyalty" discount. You can easily compare quotes by going to an insurance comparison website. find certain adequate enough to be able to one specific chicken while in. on the which it absolutely require some clear away to show up. It's not as straight-forward like extracting the main tape measure and putting width. Scrolling through your blog I see so many fresh wholesome foods and it makes me so happy! It’s so refreshing to read all your recipes. I can’t wait to try this recipe. I’m a blogger as well with an only slightly different cause...gardening. I love thinking about where food comes from so I work with a company called Cayisa to promote learning gardens, sustainable gardening, and reforestation. They’ve educated 78,000 kids about where their food comes from through their Seed for Seed program! Cayisa also sells some awesome jewerly to support their cause. You should check out the website (www.cayisa.com) and the blog (www.cayisa.wordpress.com)! Thanks! hyperdunks 2015 can use the top of the key to true, then one after the coup, unruffled, absolutely pure man child! 2015 hyperdunks suddenly remembered these days light sulk, forgot to look at the Internet market. 2015 hyperdunks actually did not quiet the sound to rise, not only to get out of trouble, and also a small profit yet.Nike Free Shoes is throwing punches friends, Huo Guangli know by punching him, we always hang out together. Nike Roshe Run Shoes bought a bunch of fakes hurt the heart, now do nothing, just a day of debauchery fun. Availing the payday loans for unemployed direct lenders is the only way to get rid of financial worries. If you want to approach direct lender, Lenders Club is the right place for getting these loans on low APRs and easy repayment plans.